HINT: Click on the colors to shop! 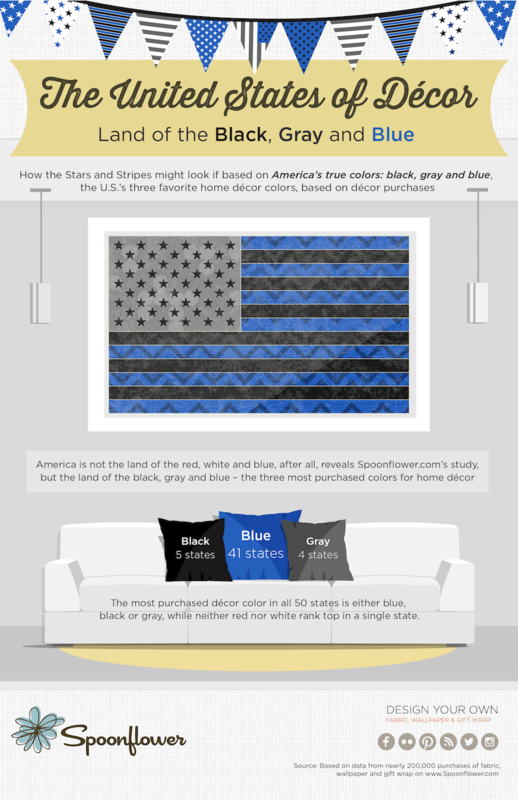 America’s true colors are not red, white and blue, after all, but blue, black and gray, according to a new study ranking the country’s favorite colors based on interior décor purchases. There are also strong regional differences in color preferences, reveals the study, conducted by Spoonflower. California and the West buy black décor most; the South likes gray; the Northeast, Midwest and the Plains prefer blue. The study’s most surprising findings for color experts include: the dismal ranking of red, in just seventh place; the high ranking of neutral colors, with black, gray and white all in the national top five; and the popularity of pink, named the most purchased color in no less five U.S. cities. "Not only have blue states wiped red ones off the map" says Allison Polish, President of Spoonflower, "but cool (blue, green) and neutral (black, gray, white) colors have left warm ones in the cold." METHODOLOGY: Spoonflower crunched the data from nearly 200,000 purchases of custom fabric, wallpaper and gift wrap by its customers over a two-year period and organized them under 15 color categories. It then weighted the scores by first identifying the number of customers buying a particular color in any given state or city and then dividing that number by the total number of Spoonflower customers in that state or city. That gave a better measure of the popularity for each color in any city or state and so identified the most popular/most purchased color in each state and city. 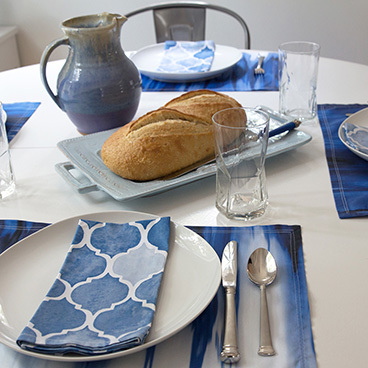 ABOUT SPOONFLOWER: Spoonflower (www.spoonflower.com) lets users design, print and sell their own fabric, wallpaper and gift wrap. Founded in 2008, it was the world's first web-based service for custom fabric creation and has become the world’s largest community of independent fabric designers. With over 750,000 designs for fabric, wallpaper and gift wrap, and more added every day, the Spoonflower Marketplace is also the world’s largest design collection of its kind. Making things with Spoonflower is the subject of a new title from Abrams Books, The Spoonflower Handbook: A DIY Guide to Designing Fabric, Wallpaper & Gift Wrap with 30+ Projects. For more information visit www.Spoonflower.com.